Evaluations of tidal wetland restoration efforts suffer from a lack of appropriate reference sites and standardized methods among projects. 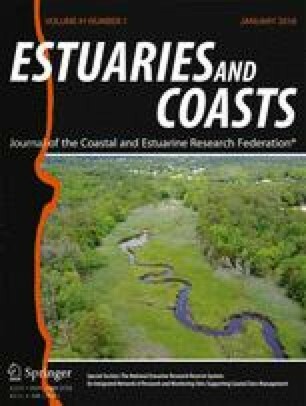 To help address these issues, the National Estuarine Research Reserve System (NERRS) and the NOAA Restoration Center engaged in a partnership to monitor ecological responses and evaluate 17 tidal wetland restoration projects associated with five reserves. The goals of this study were to (1) determine the level of restoration achieved at each project using the restoration performance index (RPI), which compares change in parameters over time between reference and restoration sites, (2) compare hydrologic and excavation restoration projects using the RPI, (3) identify key indicator parameters for assessing restoration effectiveness, and (4) evaluate the value of the NERRS as reference sites for local restoration projects. We found that the RPI, modified for this study, was an effective tool for evaluating relative differences in restoration performance; most projects achieved an intermediate level of restoration from 2008 to 2010, and two sites became very similar to their paired reference sites, indicating that the restoration efforts were highly effective. There were no differences in RPI scores between hydrologic and excavation restoration project types. Two abiotic parameters (marsh platform elevation and groundwater level) were significantly correlated with vegetation community structure and thus can potentially influence restoration performance. Our results highlight the value of the NERRS as reference sites for assessing tidal wetland restoration projects and provide improved guidance for scientists and restoration practitioners by highlighting the RPI as a trajectory analysis tool and identifying key monitoring parameters. The online version of this article (doi: 10.1007/s12237-017-0220-7) contains supplementary material, which is available to authorized users. We would like to thank Melanie Gange and the staff at the NOAA Restoration Center, Silver Spring, MD, for providing the funding, staff support, and guidance that made this project possible; everyone who helped with field work across the five reserves; and, specifically, Heidi Harris and Laura Brophy (South Slough, OR), Carolyn Currin and Mike Greene (North Carolina), Willy Reay (Chesapeake Bay, VA), and staff at the NOAA National Geodetic Survey. We especially recognize the contributions of Dr. Michelle Dionne; without her foresight, dedication, and guidance, this project would not have been possible. Finally, we wish to acknowledge the thorough and insightful comments of two anonymous reviewers whose suggestions greatly strengthened the interpretation and applicability of this work. Clewell, A., J. Reiger, and J. Munro. 2005. Guidelines for Developing and Managing Ecological Restoration Projects (2nd edition). Society for Ecological Restoration online publication: http://www.ser.org/resources/resources-detail-view/guidelines-for-developing-and-managing-ecological-restoration-projects#7. Accessed May 23, 2016.